The Americans have won more steeplechase medals than the Kenyans at this World Championships. Just how does that compute? Anyone remotely involved with distance running will recognise the validity of the question. To begin at the beginning, one of the expected highlights of the men’s steeple earlier this week was fastest man of the year, and Olympic silver medallist Evan Jager of the USA taking on the East Africans, acknowledged kings of the event. Jager did all that was expected of him, and more. He took control of the race, made the all-conquering Kenyans run for their lives, and only succumbed in the final stages, finishing third to Conselsus Kipruto of Kenya (almost inevitably) and Soufiane Elbakkali of Morocco (not unforeseen), yet winning the first ‘chase medal for the USA in the history of the World Championships. Nobody, but nobody, including the winner and runner-up, was ready for Chapter Two. As you will have long recognised the Kenyans are so good collectively at distance running that their athletes have become export assets. One such mercenary, Ruth Chebet, running for Bahrein won the Olympic gold medal in Rio last year. She is also world record holder, with a superlative 8min 52.78sec in Paris last year. Her former compatriots were evidently determined to make her work for her potential victory last night. You may recall that I wrote earlier this week about eccentric male steeplechasers from Kenya. Well, Beatrice Chepkoech put them all in the shade last night. Taking the lead nearing the end of the first lap, for some reason Chepkoech looked right as she should have been veering left into the water jump. Permit me to pause here, dear reader, and confess. Aeons ago, in fact so long ago that there weren’t even any mists of time, I committed this same fault, in the Midland Counties Junior Championship 1500 metres. Fortunately, the congregation at trackside, awaiting the inevitable ducking of the least experienced amongst us, yelled, ‘water jump’. There will have been an expletive or two but nevertheless, I emerged relatively unscathed. Unlike Chepkoech, who had chosen to have a ‘Landy moment,’ ie, look the wrong way to seek her pursuers, and was passing the water jump on the outside before she realised. Doubling back to take the water, she ended up about 30 metres in arrears, though extraordinarily, she managed to get back in the lead within two laps. But the effort was to prove her undoing. I have written in the recent past about how US college coaches have gone back to a volume training base, ie, ‘getting the miles in’ as preparation for a racing season. It has paid off handsomely.  In recent Olympic Games and World Championships, the USA has had a full complement of athletes, men and women in every event from 800 metres to the marathon, including the steeplechase. They have started to win medals too. Jager is a good example. 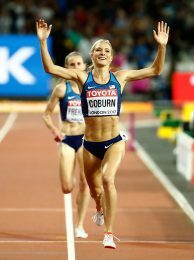 So is Emma Coburn. She won Olympic bronze last year, and was always going to be a threat to Chebet and the Kenyan women here in London. That threat was realised in full when Coburn, followed by her compatriot Courtney Frericks swept into the lead over the final water jump, and consigned the remaining Kenyan, Hyvin Kiyeng Jepkemoi to third. Coburn’s victory was no fluke. She won gold in a championship record of 9.02.58. What was more shocking, including to herself, was Frericks’ silver in 9.03.77, taking all of sixteen seconds off her personal best, set earlier this year. “I was hoping to finish maybe fifth or sixth,” she said engagingly. Shaunae Miller-Uibo should take note. We all think we know the dangers of giving kids too much screen time. But really! Miller-Uibo is, after all 23 years old. But the elegant Bahamian credits her inconceivable collapse, from first to fifth in the final 20 metres of the 400 on Wednesday night to a glance at the big screen at the end of the stadium ahead of her. It caused her, she said to mis-step, and stumble, thereby failing to add the world title to the Olympic gold she had won in Rio, by throwing herself at the line. Oh well, you win some and you lose some, but whatever the case Miller-Uibo makes it a show. She lost another one last night. Despite closing more rapidly than anyone else, she couldn’t catch the defending champion Dafne Schippers of the Netherlands, who won her second successive world 200 metres gold; and Marie-Josèe Ta-Lou of Ivory Coast, who won her second silver of these championships. Miller-Uibo finished third. But spare more than a moment for Ta-Lou. She set a national record of 22.08sec, but the collective margin of difference between those silvers and gold in both 100 and 200 metres for the Ivoirian was four hundredths of a second!